Can Mars One send the first boots to the Red Planet by 2027, with just $6 billion? When you start talking about big splashy space exploration plans—say sending the first humans to Mars on a private mission supported by a reality TV deal, eager (theoretical) billionaires, and burials in space—things can get surreal pretty fast. So it was last week, when Bas Lansdorp, CEO of Mars One set out to debate two MIT aerospace engineers on what should have been a simple question: is the company’s plan to put humans on Mars feasible? 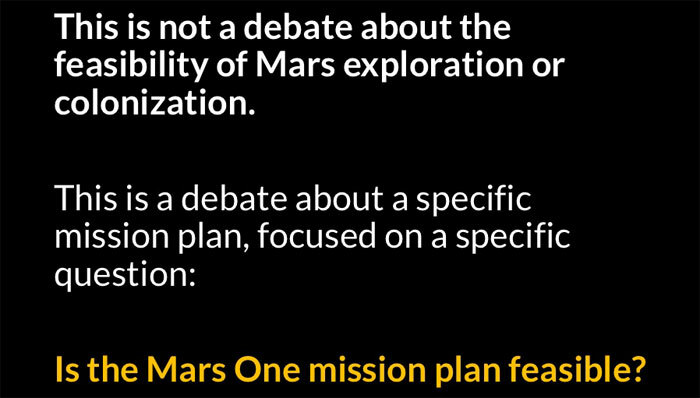 By the end it was not at all clear how Mars One defines the word “plan” and why, after publicly admitting they won’t stick to the schedule they’ve outlined on their website, they’ve been so specific about timelines and budgets. In case you haven’t been following the saga, Mars One is a private campaign to send volunteers on one-way trips to the Red Planet, where they will live out the rest of their lives in a permanent settlement and send video dispatches of their activities back to Earth. Announced in 2012, the company has very publicly hunted for volunteers for this mission and recently whittled down that list to 100 candidates. The Mars One plan begins with robotic missions to help set up the habitat and deliver supplies to the Red Planet. The first crew of four would arrive on Mars in 2027 (originally pegged for 2023). Additional four-person crews would follow every two years after that. To sustain this growing settlement, the mission would likely rely on a mix of supply missions and in situ resource utilization, baking Martian soil to extract water and oxygen and pulling nitrogen from the Martian atmosphere to add to the settlement’s supply. Skepticism has been a running theme since Mars One was announced. In 2012, Wired gave the company’s plan a plausiblity rating of 2 out of 10. And last year, researchers from MIT’s department of aeronautics and astronautics performed an independent technical analysis of the Mars One plan. They found multiple problems. For one thing, spare parts would take up an increasingly large fraction of the available launch mass. And, if the astronauts grow all their own food, the plants could create unsafe levels of oxygen and the rapid depletion of the habitat’s nitrogen gas supplies within a matter of a couple of months. News stories led with the suffocation angle. Mars One didn’t react well to the criticism; one team member called the findings “made up and fake”. Last week’s event took place at an annual meeting of The Mars Society in Washington, DC. The debate pitted two of the MIT study authors, Sydney Do and Andrew Owens, against Lansdorp and aerospace consultant Barry Finger of Paragon Space Development Corporation, which recently conducted a study (pdf) of Mars One’s life support needs. The company has said it will need $6 billion to get the first humans to Mars by 2027. Do and Owens focused their analysis on those numbers, asking whether the company’s plan could be accomplished by that date with that amount of money, in adherance to the “iron triangle” of project management. 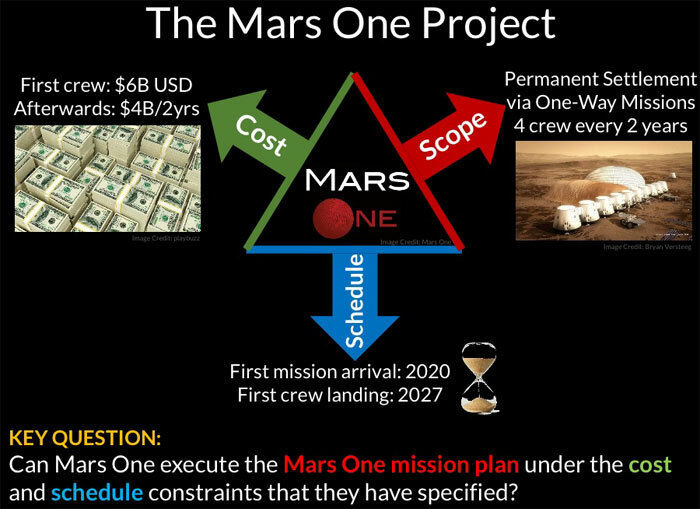 Mars One claims the major technology needed to accomplish the company’s plan already exists. But Do and Owens laid out a rather daunting list of things that still need to be developed in order for the mission to succeed. The company will land masses at least twice as heavy as NASA’s Curiosity rover, the heaviest thing yet landed on the surface of the planet. The crew’s habitat must have life support that can survive for the 26 months between resupply missions, a level of endurance they say is 23 months beyond that of the International Space Station’s systems. And the robotic spacecraft that will arrive before humans must have an unprecedented level of capability. Mars One aims to use an intelligent rover to set up the habitat for the humans to follow. “Right now we can’t do this on Earth and this is expected to be done on Mars,” Do said. A comparison of eight years of Apollo and the Mars One’s plan, up to the first crewed landing. Lansdorp’s presentation contained a single slide, showing how the concept for Apollo launch vehicles changed over time. “We’re not going to do, I think, the current design of the mission,” Lansdorp said. He noted that the organization’s plans were based on preliminary work and would change with additional study findings. As an example, Lansdorp cited the recent Paragon study, which found that the mass of the life support system would be higher than expected. The company is currently seeking $15 million to finance the buildup of its team and commission additional studies—in particular one by Lockheed Martin on the entry, descent, and landing stages of the mission. He added that it’s not impossible that a billionaire might call up and offer to finance the whole endeavor, which would speed the work along. It was hard not to come away from this debate thinking the two sides were talking at right angles to one another. Owens and Do took Mars One’s numbers seriously in their analysis. Lansdorp seems to consider the company’s cost estimates and launch dates as notional, or aspirational, figures. In discussions with others at the meeting, I’d wondered aloud what repeated delays might do to the image of the company. But Do voiced an even bigger concern after the debate: if Mars One deflates, what will happen when the next plan to go to Mars comes along? Even if the new effort is deemed technically sound and eminently accomplishable, will anyone pay it any mind?